With the school year end coming up quickly we have been extremely busy with our year-end plans and look forward to our year end recital June 15th! That being said, our administration has been overwhelmed planning our recent and up-coming events as well as with requests for new registrations as we move into our summer schedule plans and move into fall registration which is available now. Your patience as we get to your request is very appreciated and if you have yet to get registered and need more info, please contact us during our regular office hours. 12 String Studios will not be having music classes starting today, Friday, March 29th, - Friday, April 5th. Classes will resume Saturday, April 6th. The Office will still be open Monday - Thursday, 11am - 3pm. Classes not effected by this holiday are as follows: Parent & Baby Yoga, Prenatal Yoga, Adult Beginner Yoga, and Adult Zumba. Have a fantastic Easter break everyone!! Studio XII Music & Dance Co. 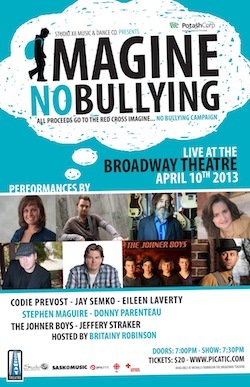 Studio XII Presents the Imagine... No Bullying Concert! It's with great excitement and anticipation that 12 String Studios present the Imagine... No Bullying Concert fundraiser for the Red Cross. Months of planning involving many great artists and sponsors to join the fight against bullying in our community. Presented by our parent company, Saskatoon’s Studio XII Music & Dance Co, the night will feature three-time Juno nominee Donny Parenteau, Western Canadian Music Hall of Fame inductee Jay Semko from The Northern Pikes, two-time Canadian Country Music Award nominee Codie Prevost, as well as Saskatchewan favourites Jeffery Straker, Stephen Maguire, Eileen Laverty and The Johner Boys. The CBC’s Britainy Robinson will MC the event. Click here to join the Facebook Event Page. FREE Kids Self Defence January 15th! This Self-Defence Workshop will prepare the participants to defend themselves successfully from a possible attacker. Learn how to be aware of your surroundings to recognize and avoid compromising situations! Edwin Viloria is the Vice President of Global Sikaran Federation and holds a 7th degree black belt(master's degree) in the Filipino martial arts of "Sikaran", "Buno", and "Arnis". 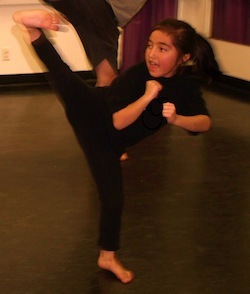 Mr. Viloria is also a Grandmaster and Founder of a martial arts discipline called "Sun-Pa". To register, please contact us! Enter to win $150 at the Keg!! The first 150 people to purchase a Studio XII Membership Card will be entered to win a $150 Gift Certificate to the Keg! 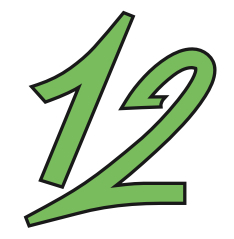 Why do you need a Studio XII Membership? Well you get all sorts of deals and discounts which include 10-20% off all music, dance & fitness classes, 10% off eight Subway Restaurant locations in Saskatoon, 10% off a table of four at LaBamba's Mexican Restaurant and more! Membership Cards are only $50, call or email today! 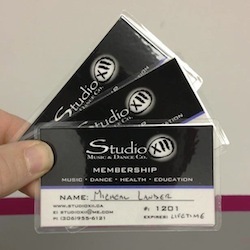 50% off our Studio XII Membership Cards this week only!! THIS WEEK ONLY!! PRE-SALE 50% off our new membership cards! Get your one year membership this week for only $25! In the New Year these Membership will be for $50 each or a family pack of three for $125. Contact us right away and please tell your friends. (306) 955-6121, or studioxii@me.com For the next five days only! 25% off of Tuition in December!! For the month of December 12 String Studios is offering 25% off when you pay for the rest of the school year! This has never been offered before but we wanted to offer something special for Christmas aside from our annual Christmas Recital. A great Christmas Gift for the Holiday Season! Book your spot now as after New Years we know we will be having a lot of new students coming to our school. We also have Gift Certificates for Music Lessons(Guitar, Piano, Voice) and even Dance, Health & Wellness Classes through the Aspire Dance School! Offer applies to new students only or current students wanting to add a new instrument! Pick the music teacher that's right for you! The challenge we all face when looking for a new service is knowing what we're buying into. How can we tell what are truly good opportunities for ourselves and our children? Here are some important qualities to keep in mind when you're looking for an instructor. Seek out a person with integrity - someone who is transparent and honest about his or her skills and expertise. A person who is dedicated to putting your family's needs first. Although we believe everyone deserves the freedom to teach, working with teachers who are open about their intentions, and have a true passion for education is a surefire path to success in musical studies. You can find teachers like this at 12 String Studios. Give us a call, send us an email, or check out our website and register online right away to start your next musical experience! Broadway Musical Theatre Training Auditions in Saskatoon! 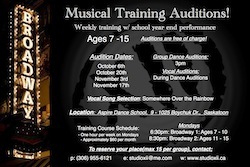 Starting October 6th, the Studio XII Music & Dance Co. will be hosting audition dates for its new Broadway classes! Starting at 3pm they will be having group dance auditions and you will then be escorted to a vocal audition afterwards! Classes have already started but if you know anyone between 7-15 interested in specific Broadway Training accompanied by professional musicians, please tell them about this great opportunity! For Ages 7 - 15, you will be auditioned in a group dance setting by our dance instructor and then escorted to our vocal coach for analysis! The Auditions are free of charge! Students will expect to perform a minimum of three songs with possibly some dialogue. Course is approximately $60 per month which includes additional rehearsal times. LAUNCHED!! 12 String Studios Music Schools brand new website!! It's been with great anticipation that we finally have our new website up and running! This is our third website launch in the past couple months and with more great features and services for our supporting families and staff, please explore our new page to find out all the new things we are starting to implement! This is all because of the support the City of Saskatoon has shown us and it could've have happened without it. This website is a testament to how much work we put into making sure your support goes right back into the community it serves. To see our other websites please visit: The Aspire Dance School and The Coda Project! More things are on their way so stay tuned! !